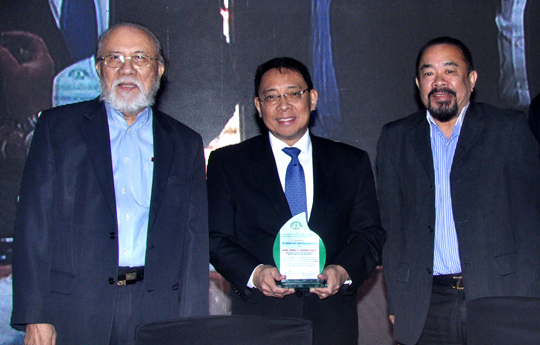 Bangko Sentral ng Pilipinas Deputy Governor for Monetary Stability and Economics Diwa Guinigundo (center) is the guest of honor and speaker at the first monthly business meeting of the Chamber of Real Estate and Builders’ Associations Inc. in Makati City. Guinigundo cited key figures on the unused agri-agra funds of banks earmarked for housing purposed under Republic Act 7835. Creba is supporting the bill filed by House Speaker Gloria Macapagal-Arroyo and Sen. J.V. Ejercito making this part of a P270-billion Comprehensive Home Financing Program to accelerate annual housing production to 500,000 units and address homelessness in 20 years. With Guinigundo are Creba national chairman Charlie Gorayeb (left) and national president Noel Toti Cariño. Topics: Bangko Sentral ng Pilipinas , Diwa Guinigundo , Chamber of Real Estate and Builders’ Associations Inc.